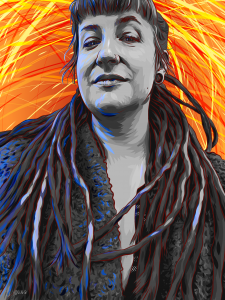 Digital artist Jessie Young learned as an adult she had a condition called “face blindness,” meaning her brain processes faces differently than typical brains and, as a result, she has a hard time recognizing people. “When I learned this it felt like discovering that everyone around me had X-Men powers,” she said. 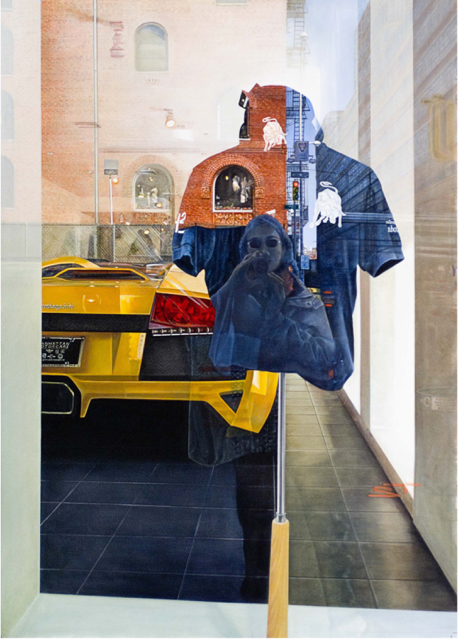 Justin Kim’s work, on view at Williston’s Grubbs Gallery through April 28, combines the grand tradition of figure painting with a contemporary sensibility, exploring themes including archetype, pastiche, authenticity, and the relationship between technology and the artist’s hand. In addition to landscapes and figures, Kim works on miniature collages, combining forms and figures from traditional painting. 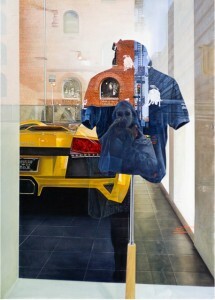 His work generates tension between artifice and reality while challenging traditional painting structures. Born in Hartford, Connecticut, Kim received a B.A. from Yale University and an M.F.A. from the American University in Washington, D.C. He interned with the artist David Hockney, and has taught at Yale, Dartmouth College, Smith College, and Deep Springs College in California. The recipient of several residencies and awards, he has exhibited both regionally and nationally. Tonight in the Grubbs Gallery, the Trimester 2 Arts Walk will offer an opportunity to see student work in the Grubbs Gallery and hallways of Reed Campus Center, from 6:30 – 7:45 p.m. Come by for fun, food, and art, after the team dinners! From February 18-20, Williston students presented the annual Winter Theatre Lab performance, this year entitled “Fish Out of Water.” See photos here. At “Songs of Then and Now,” a Winter Choral Coffeehouse, students performed a variety of songs, from pop music to madrigals. See photos from the February 26 event here. Dance and choreography students presented their work in an afternoon performance in the Chapel on Monday, February 29. 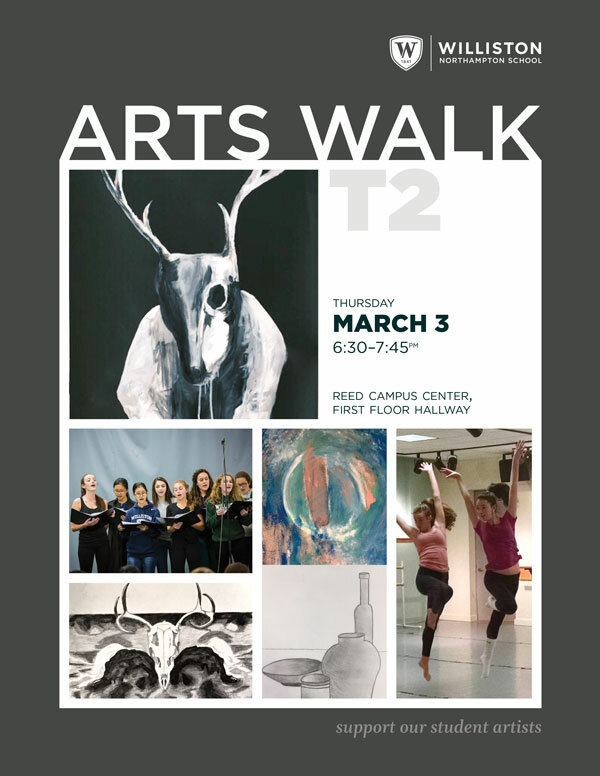 This Thursday, March 3 in the Grubbs Gallery, the Trimester 2 Arts Walk will offer an opportunity to see student work in the Grubbs Gallery and hallways of Reed Campus Center, from 6:30 – 7:45 p.m. Reception: Saturday, November 7 from 1:00-3:30 p.m. Working with prints and collage, Linda Batchelor explores the emotional harmonies created through colors and patterns. Her work ranges from stylized bottles and figures to the most abstract. 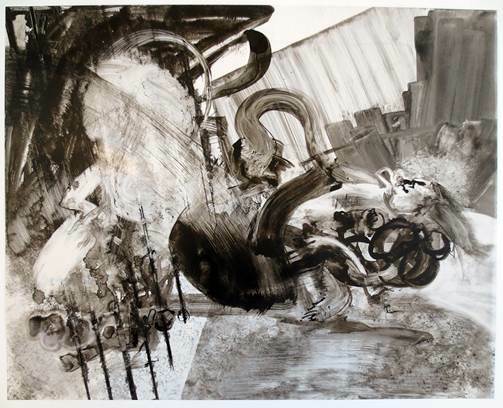 After focusing on monotypes and collages, Ms. Batchelor has recently been working on larger scale pieces. In her artist statement, Ms. Batchelor notes her earliest efforts at collage were “jazzy and colorful with a sense of humor,” but that she has lately increased her focus on straight monotypes. 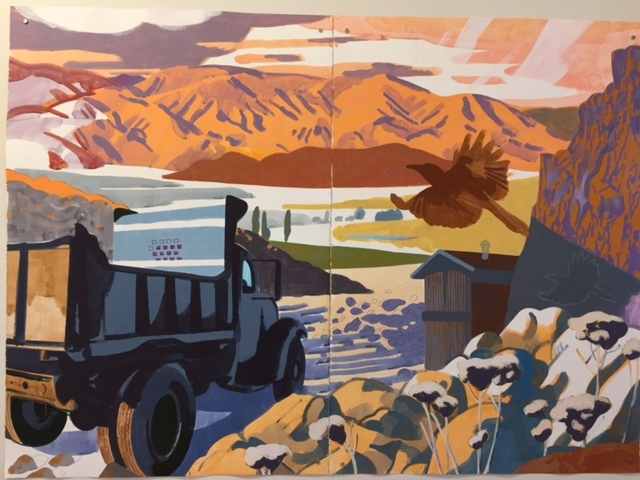 The award-winning artist, who includes a merit prize from the Smithsonian American Museum of Art among her various accolades, has exhibited both regionally and nationally. Ms. Batchelor’s work is featured in collections at the Boston Public Library, Baltimore City College, and Fidelity Investments. She attended Brown University and Maryland Institute of Art and has a studio at One Cottage Street, Easthampton. Light and geometry are the two themes that run through the whole of David Gloman’s paintings, whether he’s working on a watercolor of the Southwestern desert landscape or an oil painting of a swimming hole in the woods. 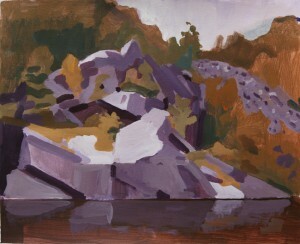 The paintings in the exhibit—created through the in-nature style that Mr. Gloman has perfected through his use of a truck-based mobile studio—feature such locations as the Green Mountain National Forest, Chesterfield Gorge, Dead Branch of the Westfield River, and Chester, MA. Mr. Gloman is the artist in residence at Amherst College and offers Saturday art classes in the fall and winter for talented high school artists. He has previously worked with such Williston student artists as Emma Kaisla ’15. “Rocks and Water” will be on display in the Grubbs Gallery from October 1-29. 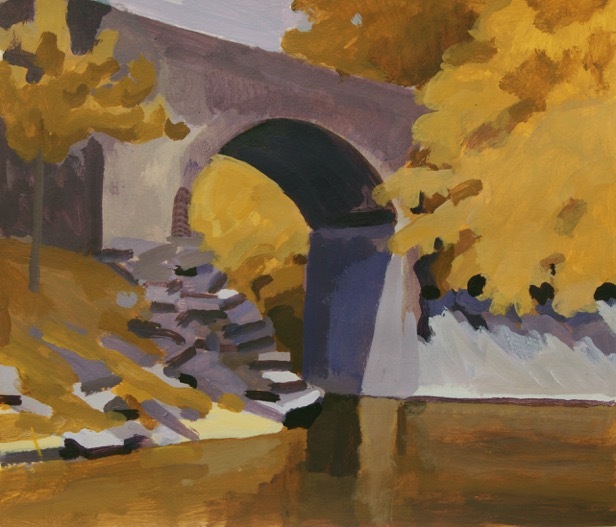 A reception for the artist will be October 10 from 1:00-3:30 p.m. in the gallery. A husband and wife team, who explore the space between realism and the abstract, will open the Grubbs Gallery 2015-16 season. See Grubbs Gallery hours. Agnes de Bethune and Thomas O’Flynn met in Boston in the 1970s and began traveling the country, refining their own styles: his in collage and sculptural assemblages, hers in the two-dimensional realm of oils, watercolors, and acrylics. Although the art they create is distinct, Ms. de Bethune and Mr. O’Flynn have had a long history of mutual inspiration. Arguably one of the best examples of their playful collaboration is their annual holiday card, which can be assembled into a 3D art cube. Turn the cube one way and it becomes Ms. de Bethune’s hyper-realistic oils; turn it the other, and it’s suddenly Mr. O’Flynn’s assemblages. Ms. de Bethune, a Massachusetts native who lives and works in Jersey City, received a Fellowship from the New Jersey State Council on the Arts. She has worked as a graphic artist, as a teacher at Pratt Institute in New York City, and on museum exhibits. Her work been exhibited in New York City and elsewhere in New England and California. Prior to establishing her own studio, she attended Massachusetts College of Art. 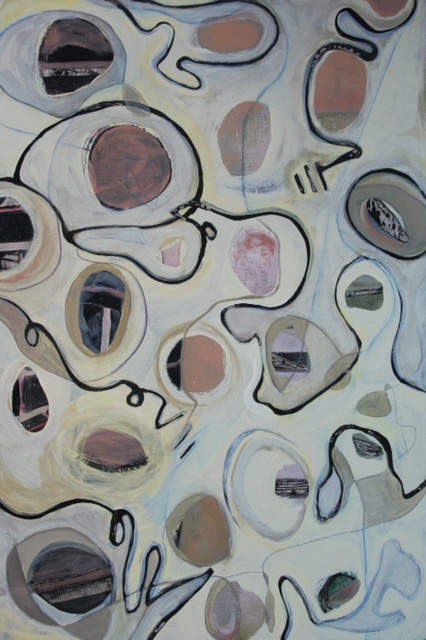 This year’s exhibitions in the Grubbs Gallery will focus on mixed media and bold style. That’s particularly true with a series of artists who specialize in multi-dimensional work. The first exhibit features a husband and wife team (Agnes de Bethune and Thomas O’Flynn) who together combine painting and found-object sculptures. 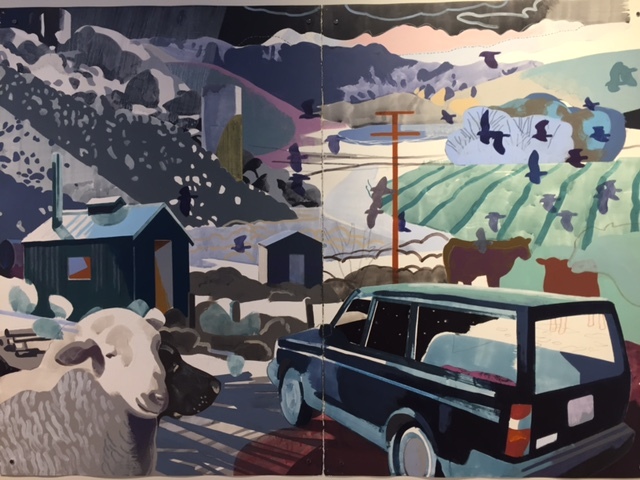 December’s artist, Linda Batchelor, features the unification of painting and collage, while Jessica Tam, whose exhibit is in January, uses such materials as acrylic, oil, etching ink, and spray paint on paper. I am hoping that these artists will inspire our students to push beyond using one medium in isolation and will make them want to experiment with combinations of materials in both their two-, and three-, dimensional work. Several artists in this year’s lineup share a bold style. Artist Eric Wolf (February 2) uses india ink on paper primarily to depict abstracted and stylized Maine landscapes. Painter Dave Gloman (October 1) will return to the gallery after a recent spell on the road. He spoke in the gallery a few years ago as he was about to set off for a painting trip in the southwest in a modified studio-on-wheels truck (which he showed to our students). 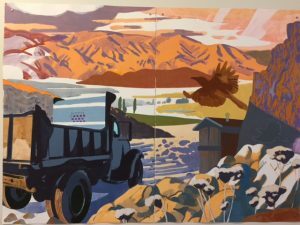 This year’s exhibit will feature paintings from that trip of southwestern landscapes and will be an excellent follow-up for some of our students who remember his first exhibit and gallery talk. Both Mr. Wolf and Mr. Gloman share a striking, graphic, and non-traditional approach to landscape painting—with very differing results. I anticipate that this will influence our students, who respond well to large, straightforward, and high-contrast work (as we all do). 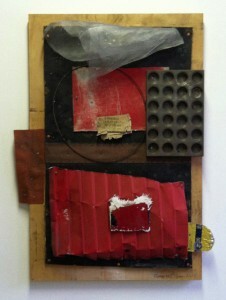 In April, the gallery will feature the work of our Visual Arts faculty. We generally hold a faculty exhibit every few years because of the incredible energy and excitement it causes in our Arts Department (for both students and faculty) and throughout our community in general. 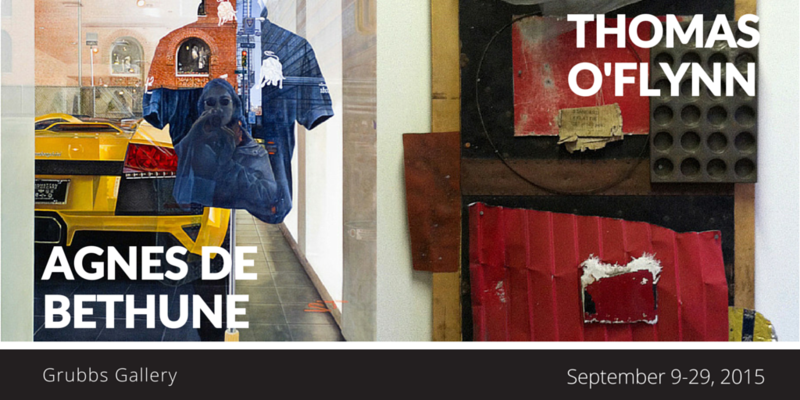 After the faculty show, we will have our first ever student-curated exhibit. This will give a student, or several, a chance to conceive of, and produce, a student show based on a theme they choose. In this way, students can experience the flip side of gallery management. This is the beginning of increased student involvement in the running of the gallery, which we hope to grow into an exciting and comprehensive program in the future. Reception: Saturday, October 10 from 1:00-3:30 p.m. Reception: Saturday, January 9 from 1:00-3:30 p.m. Reception: Saturday, Feburary 20 from 1:00-3:00 p.m. Reception: Saturday, April 23 from 1:00 – 3:00 p.m.